Kate Tempest is set to headline this year's Larmer Tree Festival. The award-winning festival returns this summer, with a bumper bill that includes music, comedy, theatre, debate, and more. 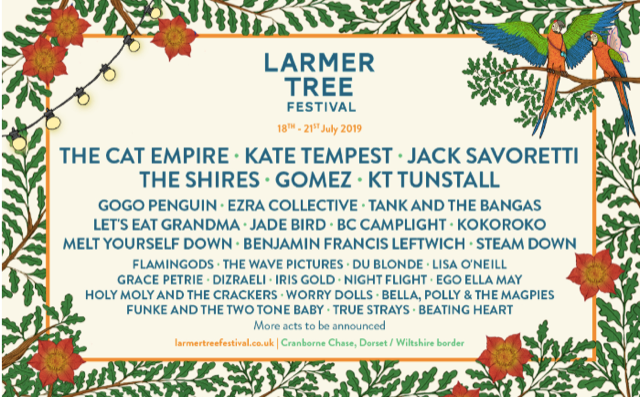 Kate Tempest will headline the event, and the multi-talented playwright, novelist, and spoken word artist is the perfect fit for Larmer Tree. Righteous jazz force Ezra Collective will hit the festival, while South London's Steam Down will also make themselves known. Let's Eat Granda are intent on bringing their dazzling live show to LarmerTree Festival, with Benjamin Francis Leftwich set to appear. Elsewhere, you can soak up KT Tunstall, Gomez, Flamingods, Du Blonde, The Wave Pictures, and Ego Ella May. Larmer Tree Festival takes place between July 18th - 21st.